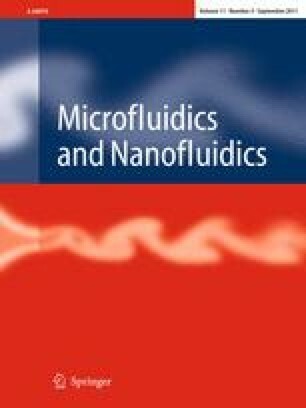 This article describes the fabrication of microfluidic networks (μFNs) from a commercially available (styrene)–(ethylene/butylene)–(styrene) (SEBS) block copolymer (BCP). The unique combination of hard and elastomeric properties provided by this material promotes high-throughput replication of fluidic structures using thermoforming technologies, while retaining the advantage of quick and easy assembly via conformal contact, as commonly achieved for devices fabricated from poly(dimethylsiloxane (PDMS). We employ Versaflex CL30, which is optically transparent, available at low cost (e.g., $2.50/Lbs), and likely to be compatible with a broad range of biological species. We demonstrate excellent fidelity in replication of fluidic structures using hot embossing lithography in conjunction with a photolithographically prepared Si/SU-8 master mold. Moreover, we introduce rapid prototyping of high-quality structures using an approach that we call soft thermoplastic lithography (STPL). Thanks to the rheological characteristics of the SEBS copolymer, STPL enables thermoforming on a heated master at temperatures around 170°C. Using this approach, replication can be completed within a very short period of time (e.g., less than 3 min) without the need of resorting to pressure- or vacuum-assisted instrumentation. Serving as a proof-of-concept, we devise a μFN that is suitable for the formation of miniaturized arrays comprising fluorescently labeled oligonucleotides and proteins on hard plastic substrates. Resultant spots are characterized by high fluorescent contrast, excellent edge definition, and uniform distribution of probes within the modified areas. We thank our colleagues Hélène Roberge, François Normandin, Kien Mun Lau, Yves Simard, and Pierre Sammut for technical assistance as well as Régis Peytavi, Gerardo A. Diaz-Quijada and Daniel C. Tessier for useful discussion. This work was supported in part by the National Research Council of Canada, Génome Québec and Genome Canada.